On August 9, Yuehua Entertainment and Mavericks Entertainment released a joint statement to announce that their artists Meng Meiqi, Wu Xuanyi and Winnie Zhang Zining are being withdrawn from Rocket Girls. Rocket Girls is a girl group that was formed out of the eleven winners of the reality show Produce 101 back in June. Meng Meiqi and Wu Xuanyi who are members of the South Korean-Chinese girl group Cosmic Girls won 1st and 2nd place. I haven't been able to keep up with the issues plaguing the group but it seems to have been nonstop from the day the group was formed and that was less than two months ago! It must be appalling for everyone involved especially the girls who had to go through so much only to end in this way. I wonder what happens to the band now. This summer, 101 girls from Tencent’s Produce 101 poured sweat and tears on stage and received much love and support. Yuehua Entertainment, Mavericks Entertainment (referred hereafter as the companies) and their artists Meng Meiqi, Wu Xuanyi and Zhang Zining are very thankful as contestants. As the management company, we give importance to the artists’ wishes. Meng Meiqi, Wu Xuanyi and Zhang Zining have walked a difficult road. We saw their journey and treasure them as individuals. We and Hainan Zhou Tian Entertainment began our cooperation hoping to rely on a joint effort to develop the artists and their activities to turn Produce 101 into an iconic reality show for 2018 and for the artists to improve through the experience. However, during the cooperation, we cannot help but see the various issues that have risen. Unreasonable workloads have caused emotional stress and health problems. Zhang Zining had to attend training and was unable to get medical attention in time, so she had to endure pain for a prolonged period. Through the cooperation between Yuehua Entertainment and Zhou Tian, it was agreed early on that both companies will hold activities at the same time. In the past months, Yuehua has tried to work with Zhou Tian in hopes that both sides can arrange reasonable schedules so that Meng Meiqi and Wu Xuanyi can participate in Comic Girls activities, but it was rejected. On the formation or Rocket Girls, Zhou Tian and the team managing Rocket Girls has not taken into account the girls’ health in arranging their schedules. We are very disappointed. We acknowledge the importance of having a contract, but we also understand our responsibilities. As management companies, we have to protect our artists. 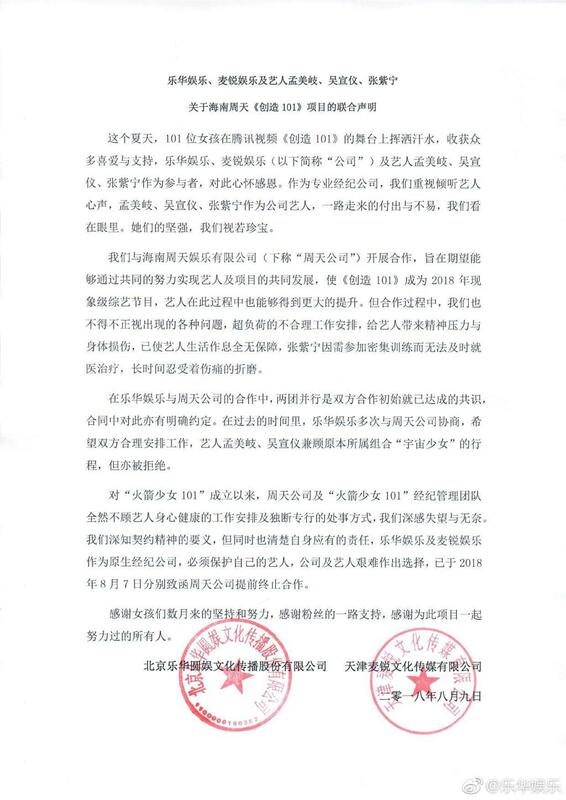 The companies and the artists have made this difficult decision and have sent the letter of contract termination to Zhou Tian on August 7, 2018. Thank you to the girls for their months of hard work and persistence. Thank you to the fans’ support. Thank you to everyone who has worked hard for this. They use unreasonable workload as an excuse, but they still want the girls to work simultaneously in both Rocket Girls and Cosmic Girls? Now wouldn't that even be more of an unreasonable workload? It'll tire the girls out even more.